I went back to the hospital today for the first time since my discharge. Routine follow-up stress test and pacemaker check. As I began the test, which involves incrimental exercise on a treadmill, I noticed on the monitor a data field labeled "Bruce." Finding this a bit odd, I asked the technician what it was, and she said the test was named after "Bruce somebody." I love the thought of eponymous honors sticking to just first names. 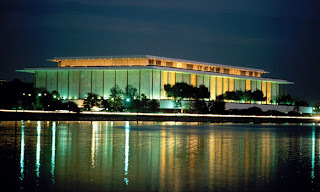 Washington, D.C.'s famed John Center for the Performing Arts. But alak, the Bruce treadmill protocol is named after Dr. Robert Bruce. Although, if there's any justice in the world, he named his son Bruce. Very little of note to report, except in between appointments I went into Westwood to pick up a Philly cheesesteak for lunch. I went to college outside of Philadelphia, yet I'd never had a cheesesteak until last month, when a friend came to visit me in the hospital and brought one. It was one of my top-two meals the entire month in the hospital. So I had this weird, resentful nostalgic desire to have another. Also, it was tasty. But I couldn't remember the name of the place and I didn't know where it was. I asked at the hospital information desk, but none of the four people stationed there knew. So I wandered down Gayley St. asking college-looking folks if they knew of a really good cheesesteak place in the area. Amazingly, nobody whom I asked knew; so I headed towards the Starbucks to ask a barista. As I walked east on Wayburyn, I noticed droves of people lining the streets, politely if giddily gathered behind metal barriers. As I got to the Starbucks, I saw that these people had gathered for the premiere of "Public Enemies," Michael Mann's new movie. But on closer inspection, they revealed themselves to be no ordinary people, but full-blown weirdos. Autograph-seekers and aspiring stalkers. One woman had lots of Johnny Depp paraphernalia, and she was even sitting on a huge Johnny Depp beach blanket. I wouldn't have thought such things existed, either, but there she was, sitting atop her Johnny Depp beach blanket. (And, Dear Reader, even if one could argue for the functionality of a Johnny Depp beach blanket, why on earth did this woman feel compelled to bring all the other crap? Was she really worried there'd be any equivocation about her status as Johnny Depp's #1 fan? Wasn't her sitting on a sidewalk for hours and hours in the hopes of catching a glimpse of the man not proof enough? Trust me, lady, your title remains unchallenged.) The whole thing reminded me of the general bizarreness of Los Angeles, and of the further bizareness of UCLA--home of the Ronald Reagan Medical Center. Or, as I call it, the Star of "Bedtime for Bonzo" Medical Center. Fortunately, the Starbucks barista knew the name of the cheesesteak shop (South Street) and its elusive location (across the street). I still felt a somehow criminal walking around Westwood: a vestige of my few elopements (See "AWOL" and "Cinco de Mayo Clinic!" below), I suppose, as well as some autonomic fight-or-flight reflex triggered by proximity to the hospital. Even though I've been off them for several days. Note, not a photo of the author.